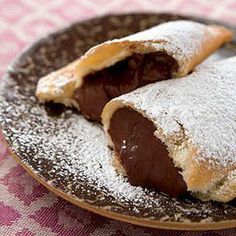 In a heavy, medium saucepan, combine the half-and-half, chocolate, granulated sugar and cornstarch. Bring just to a boil over medium heat and cook, whisking, until thickened, about 1 minute. Remove from the heat and stir in the butter. Let cool slightly, then press plastic wrap onto the surface to cover. Refrigerate until cold, at least 2 hours or overnight. In a large bowl, toss together the flour, baking powder and salt. Using your fingers or a pastry cutter, mix in the shortening until coarse crumbs form. In a small bowl, beat together the whole egg and ice water. Stir into the flour mixture with a fork until the dough comes together. Divide into 6 even balls. On a lightly floured surface, roll each ball of dough into a 6-inch-wide disk. Brush a 1/2-inch border of the beaten egg white around each rim. Spoon 1/3 cup of the chilled pudding in the center of each disk, spreading slightly. Fold the dough over the filling to cover, press the edges to seal, then crimp with a fork. Transfer to a parchment-paper-lined baking sheet and refrigerate until ready to fry. In a deep, heavy 9- to 10-inch skillet, heat the oil over medium-high heat until it registers 375 degrees on a deep-fry thermometer. Add 2 pies at a time and fry, turning 2 to 3 times, until deep golden, about 3 minutes. Let cool for 15 minutes, then dust with the confectioners' sugar. Bake the hand pies in a 375 degrees oven for 25 minutes if you don't want to fry them, then dust with confectioners' sugar. To prevent lumps, mix the cornstarch with the other ingredients before heating. Test your oil temp by dropping in a pinch of dough -- the oil should sizzle immediately. Stir a little cocoa powder into the confectioners' sugar for a chocolatey dusting.